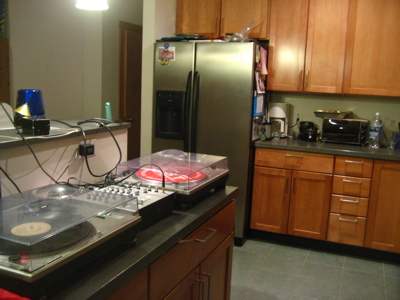 Decks, efx, a concrete counter and easy access to the fridge: the ideal DJ set-up. The idea, of course, never got off the ground, not because it wasn’t a winner, but because there were other things going on in all our lives. But this New Year’s Eve, Posie and I finally got around to hosting a dance party at our house as we’d intended to do ever since moving in back in September of ’07. And when it came time to bring the turntables and mixer down from my office for the occasion, it dawned on us (sixteen months in to our new residence), that our kitchen island was the perfect DJ set-up. As someone who’s seen their records skip and jump in many a high-end nightclub, who’s suffered for access to their boxes of records, who’s struggled for sufficient light, and lacked for monitors, I know of what I’m talking, and there’s not much more you can ask for than a concrete island big enough for turntables, mixers and records, all at spinning height, with a built-in shelf above to prevent people from jogging your records and on which to position a monitor. And with close access to the fridge as a bonus. 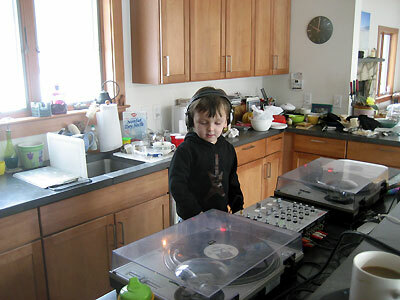 In fact, the set-up is so ideal we’ve decided to leave the turntables in the kitchen for the time being. It’s not like they see enough action up in my office. Our New Year’s Resolution: play more viny! As you can see, young Noel is adding DJ skills to his rapidly expanding musical repertoire. 1)	My first ever elementary age DJ set for the little kids who wouldn’t go to bed: “Whip It,” “Surfin’ Bird,” “I Like To Move It” and “Cool Jerk.” Great songs all, and once they were up and dancing, so were the parents, after which there was no turning back. 2)	The woman I’d never met before who came up to me in my own house and said, “Do you have any Madonna?” In part because I had a sign prominently displayed that read “The DJ is not a jukebox: thank you!” and in part because requesting Madonna is a 20-year old cliché, I honestly and truly thought she was joking. When I told her as much, I think I offended her. Oh well. The offense wasn’t half as great as waking up the next day to find that someone had left behind a fox stole in our house. Clearly not someone who knows us very well. 3)	All those great “northern soul” singles I bought in a job lot back in 1981-82, which traveled across the ocean with me, and which I now know so much more about given that I’m that much older and live in the land in which they were made. Praise be to Chuck Jackson, The Cookies, Jimmy Castor, Maxine Brown, Junior Walker, Candi Staton and more – and the enduring qualities of the 7” single. 4)	My favorite record of 2008 – “Girl, You Need a Change of Mind” by Eddie Kendricks from 1972. I’d never really noticed known this soul anthem until the past year, working on my book and the chapter about the disco scene, on which it was a major influence. That may be inexcusable, but I’ve been making up for it big time: I believe I must have played the track, all eight minutes, at considerable volume, some 500 times or more this year, and never tired of it. People enquired of it at the party, too. A stone classic and no mistake. 5)	“Na Na Hey Hey Kiss Him Goodbye” for George Bush at two minutes to twelve. 7)	Following Otis Redding with Cocoa Tee’s “Barack Obama,” lining up Deep Dish’s remake of “Flashdance” to get the party properly going… and the entire system blowing at 12:10am. 9)	Soulwax’s remix of MGMT’s “Kids.” “Happy House” by the Juan MacLean. The CSS vs Tom Tom Club “Let’s Make Love” mash-up. “Beat Bang” by Machines Don’t Care. And all the other great recent dance songs I didn’t get time to play. 10)	Guests – most of them parents – hanging out dancing until 2:30am. 11)	Hanging out with sleepover guests until 4:00am. 12)	Noel getting up before we went to bed! Happy New Year! “A Change Is Gonna Come” by Otis Redding instead of “Auld Lang Syne” at midnight? Now that is my idea of how NYE should be celebrated. Looked (and sounded) like an outstanding time!